In 2001, Kerala (also known as 'God's Own Country' in India) a state on the southwestern tip of India saw an unusual downpour of red rain for the first time only to be followed by many more summers of extraterrestrial red rain baffling our scientists who haven't found any traces of DNA or any known building blocks of life as we know it in the red rain cells. Dr. Godfrey Louis who was then a Professor of Pure and Applied Physics at Mahatma Gandhi University was the first one study the red cells in a laboratory. While most life we know of ceases to exist at certain temperatures and high pressures, the red rain cells seem to thrive under these extreme conditions. All test results point to the fact that these red rain cells are indeed nothing that we have ever seen before. The red rain cells showed unusual fluorescence emission peaks shifting with each change in the excitation wavelength, a shifting not seen in terrestrial bio-molecules. Dr. Louis says that the state of Kerala has had confirmed red rains in 2001, 2006, 2007, 2008, and there might have been other unreported red rains in July to August 2002 to 2005. "Proteins and other substances do not have this shifting of peak behavior. If normal Earth proteins and substances are fluorescing at a particular green color, then they go on fluorescing at that color. They don’t fluoresce and then emit red light. This particular material (red rain cells) is fluorescing like this (shifting peak behavior). To the best of our knowledge, I don’t think there is an (Earth) organism, which is doing this. That has not been seen. The conventional organisms are not showing this kind of fluorescence. On first impression one may think that a microbe without DNA violates the Panspermia theory. But this need not be true. Panspermia can still be correct provided we have a much broader understanding of life. These hyperthermophilic red rain microbes can kick start life in a hot young planet. As the planet cools , there can be an evolutionary process connecting the currently known life and the red rain type life. So the red rain type life is possibly connected with our type of life in a more fundamental way. This connection need not be in terms of DNA code. Currently there exists a great lack of understanding on how life originated in the Universe. Conversion of chemicals to Life may be having a much more longer history and steps than we presently imagine. I hope that detailed studies on the red rain microbes in future can bring in more understanding on the origin, evolution and distribution of life in the Universe. According to our hypothesis (of extraterrestrial origin), this is growing inside a comet possibly. So, if it is coming from such a body, we think this (red rain cells) has grown inside the comet. If you take a comet of size diameter 10 (6 miles) to 50 kilometers (31 miles) then inside the comet, even if it is an icy body, inside the comet there can be higher temperature due to radioactive heating or biological heating. So, inside such a comet, higher temperature and pressure can exist. That could be a natural habitat of these red rain cell organisms. 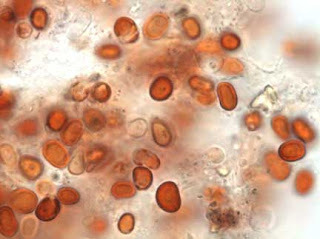 Under his microscope, Dr. Louis watched the red cells produce smaller cells internally that were colorless, or whitish. He called the new cells “daughters” of the original “mother” cells. Once he counted as many as fifteen daughter cells inside one of the adult “mother cells.” As the daughter cells grew, their cell walls also became red and eventually, the daughter cells erupted through the wall of the mother cell. For Dr. Louis, this was replication, but in normal Earth biology, replication of cell life requires the presence of DNA. He and his colleagues had looked for DNA, but were puzzled when they could not find it." 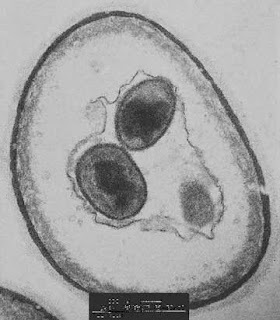 “a cell with shrunken membrane containing ‘daughters’ (internal buds). To read more on this article please visit Earth Files !